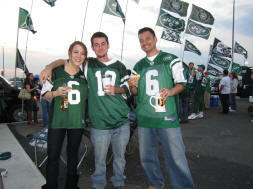 Looking for Cheap New York Jets Tickets? Stadium Review - Finally, a Real Home for Gang Green! 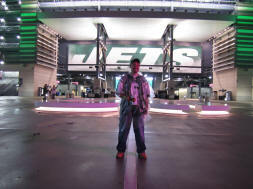 Last year when I visited Giants Stadium, or the Meadowlands as referred to by Jets fans, the building certainly had a very red, white, and blue bias, like a slap in the face of the Mighty Jets Nation. 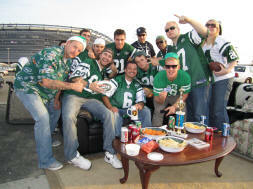 They were squatters and Giants Stadium was like a rental property occupied by Jets fans eight weeks of the year. It really didn’t feel much like a home to Gang Green. 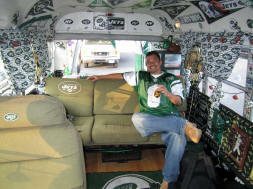 Well, with the build of MetLife Stadium, in East Rutherford, New Jersey, Jets fans finally have a venue that they can call home. The most interesting thing about MetLife Stadium is that on gameday, through the help of some innovative lighting technologies and LCD screen,s the stadium actually morphs into either a New York Jets or a New York Giants facility. 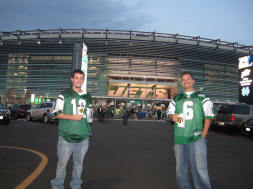 Green and white lighting and logos dominate the interior and exterior when the Jets are in town and red and blue take over when Big Blue stake their claim on the facility. Even the Pro Shop morphs along home team lines, not only by selling merchandise of the appropriate home team on gameday, but by changing its entire appearance as well. White walls provide an excellent backdrop for projected team logos and dramatic lighting schemes that bathe the area in home team colors; and wheeled product racks complete the transformation allowing the appropriate products to be easily wheeled in an out of the store. It’s actually very impressive. I was in town for a Monday Night Football matchup that would bring former Jets Quarterback Brett Favre back to the Meadowlands along with Randy Moss’s triumphant return to the Minnesota Vikings. It was sure to be an interesting night of pro football. The parking lots opened five hours prior to kickoff and as soon as we entered the lot, the energy of Monday Night Football and this resurgent Jets franchise was evident. 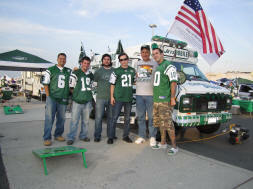 Popup tents, beer pong tables, and flat screens were all over the lot along with some exceptional tailgate cruisers sporting customized paint jobs that proudly displayed the green and white New York Jets team logos. We even stopped in on a group calling themselves “Brothers Tailgating” that had setup a makeshift living room on a parking lot median in the Green Lot. The fellas had a set of plush couches, an antique oak coffee table, and area rug centered on a 50” flatscreen hung on the side of their van. When I happened by they had just kicked off a Madden 2011 tournament, so a stopped for a few photos. 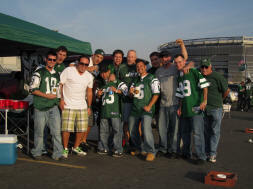 Whenever I go to the Meadowlands I always stop in on two of Gang Green’s finest tailgates, the Lot L11 Tailgaters and TailgateJoe.com. 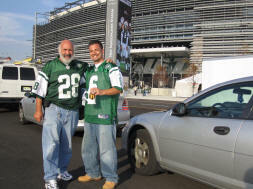 In an atmosphere of supreme tailgaters, it’s tough to single out a couple of them, but these two groups exemplify what best about New York Jets Tailgating. 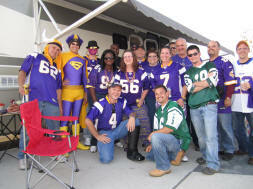 We began by stopping in on Frank Conway and the Lot L11 Tailgaters. It’s always easy to find Frank and the Boyz, you just look for the multiple flags in the corner of L11, they’re usually flying 20 -25 Jets flags on gameday and last year they even hoisted the Quest flag for me. 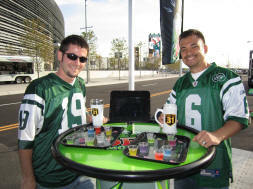 Frank always has a great group of Jets fans that are eager to talk football with an ice cold beverage of choice at the ready. When we arrived, these guys had their propane powered deep fryer going and were serving up some fried chicken along with a deep fried whole duck. For appetizers, the Lot11 Guys had bacon wrapped scallops and my personal favorite, fine cuts of charcoal flamed filet mignon served slider-style on mini burger buns with chopped onions and blue cheese dressing. These guys do not mess around. 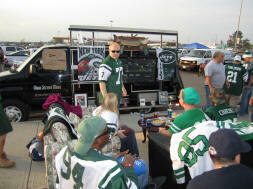 Later in the evening we made our way to TailgateJoe.com located in section E-10 of the Green Lot. 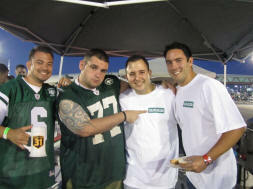 Joe and his brothers Nicky and Andrew are rising stars in the world of organized tailgating. Along with Sal, Jay, and Frankie they continue to carry the torch as premiere blacktop culinarians in the eyes of this seasoned pro. 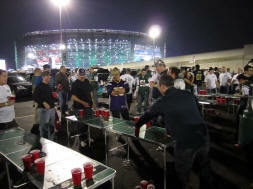 When we stopped over, Joe and the boys were in the middle of hosting a multi-table beer pong tournament. 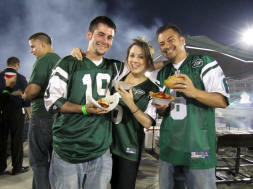 Draft beer and microbrews were flowing all night long, accented by an impressive array of tailgating foodstuffs. Half pound black angus burgers were on the grill along with fresh Italian sausage from Esposito’s pork store in New City as well as some Sabrett hot dogs. To compliment these exceptional cuts of meat, the fellas were serving up pasta with peas and bacon, a Momma Mayno, specialty along with some incredible New York style cannolis. 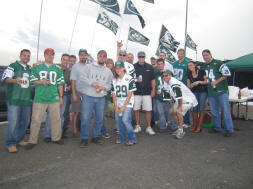 Guests that were lucky enough to latch onto a TailgateJoe party pass ate well and were thoroughly entertained by the antics of some of the most rabid Jets fans in the lot. It was truly a family atmosphere that continues to take on new members. As gametime approached, a storm front moved in from the west dumping torrential rains on MetLife Stadium along with some severe winds and lighting. Kickoff was delayed for forty minutes as the most severe parts of the storm passed overhead. Knowing there would be a 50% chance of rain, on the way into town we stopped at a Wal-Mart to purchase a set of disposable ponchos. 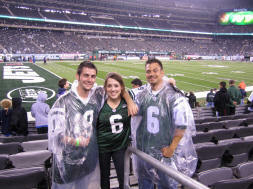 As soon as the rain hit, the ponchos were put to good use and kept us warm and dry throughout the evening. 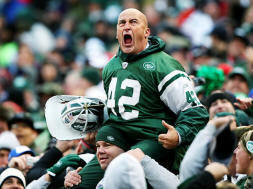 Fireman Ed keeps them involved throughout the game especially when the Jets defense takes the field. 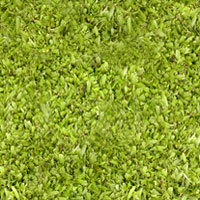 Throughout the year Gang Green maintains an imposing home field advantage that visiting offenses dread. The first half of this Monday Night Football contest was a defensive struggle with the New York Jets pulling out to an early lead with three field goals by kicker Nick Folk. In the second half, the Vikings offense led by veteran quarterback Brett Favre came back to life throwing three touchdowns to pull his team back into the game. I was able to witness Brett Favre’s 500th touchdown on an amazing throw to Randy Moss, but in the end the record setting 33rd Pick-Six thrown by Favre led to their ultimate undoing as the New York Jets celebrated an impressive 29-20 win outlasting the late rally by the Vikings offense. It was entertaining, it was wet, but definitely one of the better games I’ve attended. When you’re in New York, and you can spend the money, you should plan to stay in Manhattan. The big city lights, dizzying skyscrapers, and especially the nightlife, makes NYC the place to be. Hotels in the city will cost you though, so my suggestion is to stay near the stadium and train into the city. There are three hotels near the Meadowlands in New Jersey. Crowne Plaza Hotel Secaucus, Sheraton Meadowlands, Residence Inn Marriott . 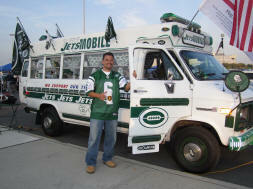 Only ticket holders with with a Pre-Paid Parking Permits will be allowed to park at the Meadowlands Sports Complex. However, the NJ Transit has just built a new rail line to service the Meadowlands Sports Complex. This is really the best way to get to a Giants Game. For more information on the new rail line click here. The only problem is that the trains don't starting running to the stadium until 10:30am on game day. Park your car at a rail station and take the rail line to Hoboken. Get off at the Hoboken PATH Station and walk upstairs to the NJ Transit Rail Station. 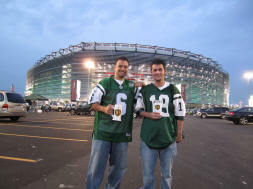 Buy a ticket to Meadowlands Sports Complex Station and locate your train to the game. Take one the subway lines to the 34St-Penn Station. Go to any NJ Transit station clerk or Ticket Vending Machine, and buy a round trip ticket to Meadowlands Station. Look on the departure boards for the next NJ Transit train that stops at Secaucus Junction Station. The screen will say "SEC" next to the line name. Board that train and ride it to Secaucus Junction, and then use your ticket to transfer via the escalators to the Meadowlands Service. If you want to get to the lot before 10:30am, take the subway lines to the Port Authority Station. From there take Bus No. 161 into New Jersey. Tell the Bus driver you want to get off near the Meadowlands. 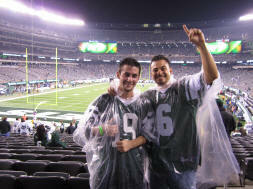 Planning Your Next Trip to see the New York Jets at MetLife Stadium? Traveling to all thirty-one stadiums around the National Football League, teaches you a thing or two about getting the most for your money. 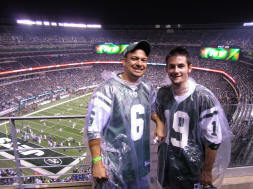 I've set up this website to help others that are interested in NFL Travel. 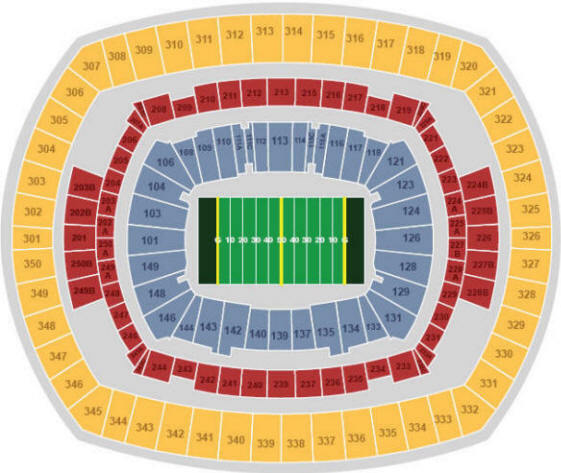 Below you'll find links for cheap New York Jets tickets, stadium seating charts, local weather, hotel, and flight information, everything you need to plan a successful trip to MetLife Stadium. 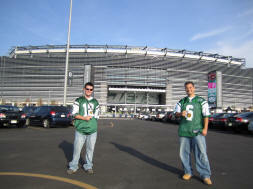 The Commissioner of Tailgating, Joe Cahn Matt and Me at the Home of the Jets I met you guys in Minnesota! Hans, Thanks for the Visit. That was a great day, and we need more like it. 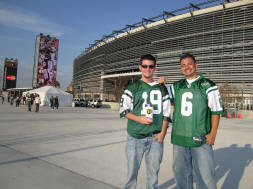 Hopefully the Jets Win over Carolina yesterday will at least be the beginning of a respectable finish to the Jets 2009 season. If possible, can you forward me a picture of you, myself and Captain Jet when you have a chance? Absolutely man, the photo is on its way! Thanks for contacting me. Hey Hans! It was great having you by, and when you have to do it all over again next year for the new stadium let us know! Great to have you out at the tailgate on Sunday and I wish you luck on your quest. Let me know when you are back in NJ and I will meet you at the game. My Giant Tailgate guys set up in the exact same spot with flags and such and you are welcome to join if the next time is a Giants game.